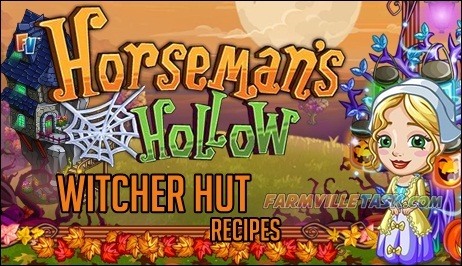 FarmVille’s Horseman’s Hollow will have it’s own crafting building called the Witcher Hut and it will be used solely for the Horseman’s Hollow bushels. Surprisingly at stage 1 it will have a total of 7 recipes. The most for any farm extension crafting building. All in all the total recipe that the Witcher Hut will initially offer is 20 recipes. Here’s the list of it in a stage by stage setting. Ghost Costume = Ghost Cream Bushel x3, Pumpkin Orange Bushel x3 and Red Maize Bushel x3. Halloween Necklace = Autumn Cabbage Bushel x3, Nightly Stick Seed Bushel x3 and Protea Bushel x3. Red Jack-O-Lantern = Pumpkin Orange Bushel x3, Ghost Cream Bushel x3 and Falling Cowpea Bushel x3. Spooky Bracelet = Glowing Mushroom Bushel x3, Cycads Bushel x3 and Fat Bulb Onion Bushel x3. Winter Broth = Orange Hymella Bushel x3, Green Camellia Bushel x3 and Purple Geniola Bushel x3. Winter Corset = Yellow Jasmine Bushel x3, Echo Shellica Bushel x3 and Red Pitcher Bushel x3. Scare Potion = Autumn Cabbage Bushel x3, Nightly Stick Seed Bushel x3 and Titan Arum Bushel x3. Scary Wig = Nightly Stick Seed Bushel x3, Titan Arum Bushel x3 and Glowing Mushroom Bushel x3. Skeletal Chair = Titan Arum Bushel x3, Cycads Bushel x3 and Fat Bulb Onion Bushel x3. Bat Wings = Pira Pira Bushel x3, Prickly Potato Bushel x3 and Palm Plant Bushel x3. Halloween Chest = Prickly Potato Bushel x2, Palm Plant Bushel x3 and Orange Hymella Bushel x3. Jewelled Spyglass = Fat Bulb Onion Bushel x3, Pira Pira Bushel x2 and Prickly Potato Bushel x3. Bats Tiara = Purple Geniola Bushel x3, Yellow Jasmine Bushel x3 and Wild Justle Bushel x3. Lost Book of Tales = Yellow Jasmine Bushel x3, Wild Justle Bushel x3 and Echo Shellica Bushel x3. Pumpkin Cookies = Green Camellia Bushel x2, Purple Geniola Bushel x3 and Yellow Jasmine Bushel x3. Dust of Courage = Autumn Cabbage Bushel x2, Nightly Stick Seed Bushel x3 and Orange Hymella Bushel x3. Halloween Gloves = Orange Hymella Bushel x3, Red Pitcher Bushel x3 and Purple Geniola Bushel x2. Spider Cake = Wild Justle Bushel x3, Palm Plant Bushel x2 and Cycads Bushel x3.